1961 Exact Date Unkown I am searching for my biological brother who I believe was born sometime in the last part of 1961. The exact date is not known but we are desperate to hear from him. I believe he would have a very light skin and possibly red hair as our Mom had red hair. He has 2 biological sisters and 1 biological brother and we would love to complete the circle and get to know him. 4th January 1961 Wednesday Cornel Lombardt (Birth name) born in Pretoria is searching for her biological mother FRANCINA LOMBARDT, (maiden name) who was from Bloemfontein and was unmarried at the time. 24th January 1961 Tuesday HANLIE VAN NIEKERK, (maiden name) who resided in Springbok, gave birth to a baby boy Heinrich Van Niekerk at Buxton House Cape Town on 24th January 1961, and was forced to give him up for adoption. HANLIE your baby has grown into a fine man and is now searching for you. HAVE YOU SEEN THIS WOMAN? CONNIE DU TOIT, her adopted daughter Cheryl Deirdre born in Pietermaritzburg is now trying to locate the mother who gave her life. CONNIE lived with Cheryl's adoptive parents ( The Linsley-Noakes) before the birth in Chapel Street P/Maritzburg. Cheryl inherited her Biological mother's Brown hair, brown eyes, receding top jaw and a gap in her front teeth. 10th March 1961 Friday Sharon Folcher (birth name) is searching for her biological mother or any information re adoption of Christina Alice Folcher born in Cape Town on 10th march 1961. 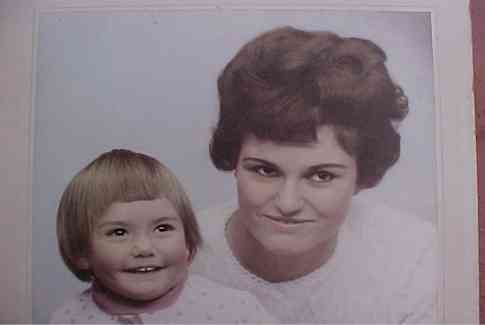 14th May 1961 Sunday Lisa a baby girl born at ST. Augustines in Durban, wishes to trace her BIOLOGICAL MOTHER. No further details are available at present. 22nd June 1961 Thursday Pa Henning,dankie, ek weet pa kon nie anders nie. Wonderlike ouers het my aangeneem ek sal net graag meer wil weet van my biologiese familie. 15/07/2004 FOUND Looking for my birth mother. I was born in Port Elizabeth in August 1961, and adopted immediately. My adopted mother has recently died of Altzheimers. 17/05/2004: My biological mothers' maiden name was Hilary Anne Featherstone. She was from a farm in the district of Miller in the Eastern Cape. She named me Beaulah, which is unusual spelling. I’m looking for my biological parents and my children are wanting to know our family history. 16/08/2009 FOUND Baby Pieter Ernest Janse Van Rensburg (a male adoptee) wishes to trace his BIOLOGICAL MOTHER who lived in Durban at the time of Pieter's birth. She was born on 23/08/1943, her last known address was Braamfontein. Mothers full names are known. 16/08/2009: Pieter's biological brother phoned Adoption Reunions, and is very excited. Pieter's biological mother is still alive. 3rd October 1961 Tuesday Jean-Paul de Villiers is seeking his biological mother. He was born in Port Elizabeth. 3rd October 1961 Tuesday Amanda is looking for her biological mother. I don't know any details about her. She apparently was a 16 year old school girl when I was born in Bulawayo. 12th October 1961 Thursday Barbara Rightfoot Robertson (birthname) who was born in Cape Town at the Mowbray Maternity Home wishes to find her BIOLOGICAL FATHER. He may remember Barbara"s Biological mother Helen, who was unmarried at the time and came from Rhodesia. Friday A male adoptee , Ian Huyser who was born in Johannesburg, wishes to trace his BIOLOGICAL MOTHER. No further details are available at this stage. FOUND I am looking for my biological mother, Ernestine Louise Engelbrecht who gave her daughter, Charmain Mary Ann up for adoption 04 June 1963 in Harare. I was born 27 October 1961 in Lusaka Zambia and believe that my Grandmother looked after me. I have so many questions? Any information relating to my mother i.e living or deceased would be beneficial. 4th November 1961 Saturday William Ernest Rasmussen, (birth name) looking to trace my biological mother as well as any brothers and sisters which I may have. 18th November 1961 Saturday Ek is op soek na my biologiese moeder Hermina Sophia Christina Maria Oosthuizen. Ek is gebore 18 November 1961 in Brakpan as Karlien Liebenberg. 23/02/2003 New Info It is of great importance that the lady who gave birth to a baby boy at the Lady Chancellor Nursing Home in Salisbury, Rhodesia on 21st November 1961 contact us A.S.A.P. John Keith Rowland Urgently needs to find his BIOLOGICAL MOTHER. The adoption file is B/E NO SB7 or Y/2851/61. 09/10/2002: Biological mother deceased. Biological sister found. 23/02/2003 Keith has a cousin in Somerset West(Cape Town) and they met for the first time on Wednesday past.Keith will meet one of his sister over the Easter weekend. One of the Aunt's will also be coming down from Pietermaritzburg during April. 29/05/2003 FOUND Urgently looking for my half brother Wynand Van Rensburg, (present name), Allan George Reynolds or Rousseau (birth name) or before returning to America at the end of October 2002. 27/01/2009 found A biological mom is searching for my son born 28th December 1961 at the Lady Rodwell in Bulawayo. Birth date may be a little earlier. 27/01/2009: the adopted son contacted Adoption Reunions from Hong Kong.